WEC specification LMP1 Hybrids have been an incredible advancement in motorsport technology over the last decade or so, and Porsche’s 919 has proven so dominant at the formula that they’ve come home with six world championship trophies and three Le Mans victories. It’s been an incredible achievement for Porsche, and has extended the legend of their motorsport provenance. The problem with racing to a formula, however, is that you are given a rulebook and certain restrictions that hinder the car’s potential. When Porsche left the LMP1 class at the end of the 2017 season, they announced a special ‘world tour’ for the car, which I mostly figured would be exhibition laps and a showcase for people to see the Le Mans winning car in person. It would seem Porsche has something cooler up their sleeve. The 2018-spec 919 Hybrid was seen testing at Spa yesterday, and it’s badass. Porsche has thrown out the rulebook in favor of outright lap time and speed dominance. As you can see from the photo in the tweet below, and the teaser video above, this new 919 Hybrid features an incredibly large rear wing that is pushed out well past the rear extremities of the car’s bodywork. 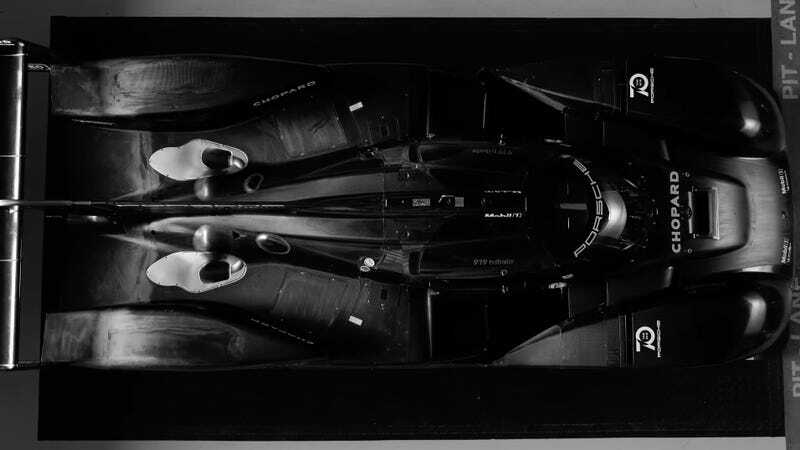 In competition, the wing has to stand within the footprint of the car. By slinging it out back Porsche is able to increase efficiency of that wing, creating a whole lot more downforce. The rear wing is also much wider than the 2017-spec racer was allowed. Similarly, massive knife-edge side side skirts have been added to help separate under-car air flow to the diffuser. So, what is the point of all of this extraneous bodywork modification? I’m forced to assume Porsche will be attempting to set some new lap records during their world tour. Porsche has not yet announced where the car will be shipped to run fast times. Some have offered Pikes Peak as a possibility, but I don’t find that particularly likely. Porsche currently owns the outright Nürburgring record, set in 1983 by Stefan Bellof. That is a record that has been called ‘unbeatable’, and surely Porsche wants to beat it. I would guess that the car will make an appearance at Porsche’s Rennsport Reunion, but can this 919 beat Marc Gene’s Ferrari Formula 1 lap record of 1:05.786 set in 2012? I guess we’ll have to wait and see.